In late summer 2017, thirty-something lead singer/guitarist Miles Baltrusaitis hadn’t played an original note of music for an audience in nearly a decade. Surprising everyone around him, he went on an intense songwriting flurry fueled by a broken heart and a suburban life rattled out of cruise control. After a month’s time, 9 deeply personal chapters of a complete narrative emerged in need of a band to bring the eclectic story songs to life. After a chance encounter, he enlisted the help of fellow Williams College football teammate and drummer Matt Stankiewicz and his keyboardist brother Dan when their neo soul band My Blue Valentine split. The three agreed to launch the band Miles Maxwell (using Miles’s middle name) when they met bassist Steve Kingwell – a veteran of numerous suburban Chicago cover bands – through a mutual friend and the lineup was complete. Genre-wise, the members have a wide range of influences including everything from pop-folkies Steve Goodman and Harry Chapin, alt-country rockers Uncle Tupelo, and the Americana legend Steve Earle. As a songwriter, Miles is a graduate of the Williams College Singer Songwriter program that also produced Molly Venter of Red Molly and Caitlin Canty. Matt and Dan’s father was a music teacher in Western Massachusetts where he encouraged them to pursue an education in music. Matt completed his degree in percussion at Williams while Dan inherited his father’s passion for vintage electric pianos. 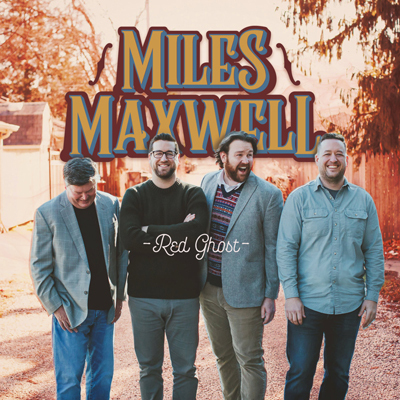 The nine compelling tracks on Red Ghost are lyrically witty and decidedly quirky, but also have a heartfelt confessional intensity that Miles never could have shared back in his 20’s. The band’s chief songwriter had to live the pain of falling for someone and watching that “girl become a ghost” (a lyric in the rumbling, Prince-styled country rocker “Something New,” which colorfully weaves the basic story) to write the tunes about it. Another gem is the tight, edgy blues-rock ballad “She Says (Whiskey Down at 4 am),” which chronicles a sleazy confrontation in a Vegas bar where secrets are revealed, true feelings are exposed and a conversation unravels a larger story. When speaking of the recording process, Miles added “I love the dynamic we have where I can bring in a crazy idea, riff, lyric or story to Matt and Dan and they instinctively know how to give shape and structure. They’ll improve on it with extended vocal harmonies, or use their deep understanding of tempo and change the rhythm scheme to make it just right.